The Paria Canyon – Vermilion Cliffs Wilderness Area has offered adventure to generations of backpackers. 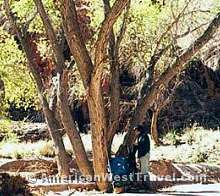 Within the wilderness, the Paria River – Buckskin Gulch complex offers challenging hiking, pleasing campsites, and remarkable scenery from Highway 89 in Utah to Lees Ferry in northern Arizona where the Paria flows into the Colorado River. The river is enclosed in towering sandstone walls for much of that distance providing breathtaking beauty. There are many terraces, which provide ideal campsites. Numerous springs provide potable water allowing trips from several days to a week. The best time of year to do the trip is spring or fall. The Buckskin Gulch is an amazing tributary of the Paria River. 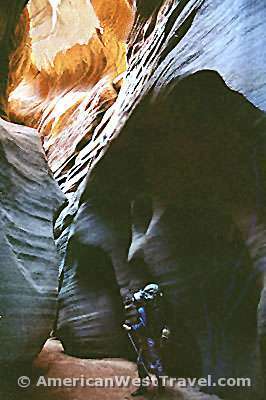 Known as a “slot” canyon the Buckskin averages 15 feet wide and perhaps 400 feet deep for a distance of almost 15 miles. In some places you can spread your arms and touch both walls! The gulch offers extremely exotic scenery. There are many spectacular photographic opportunities if you are skilled enough to work in deep shadows! Sun penetrates only around mid-day. This side canyon provides exciting challenges for the more advanced backpacker. There are many obstructions to overcome such as rock jams, rock falls, quicksand, and deep pools of icy cold water. In the event of a thunderstorm and subsequent flash flood there are few areas of escape. One can see tree trunks jammed between the canyon walls fifty or more feet above the canyon floor! Photo, right: Deep in the Buckskin Gulch, and freezing cold! Above left, a pretty camping spot in Paria Canyon. The managing agency, the Bureau of Land Management (BLM), requires permits to enter Paria Canyon and Buckskin Gulch. A daily per person fee is required (and for dogs, too). Day hikers may self-register and pay at the trailhead. Overnight users – backpackers – must obtain and purchase permits directly from the BLM or online. Only 20 permits per day are issued for the entire complex (regardless of trailhead). You may purchase permits up to three months in advance, and they usually sell out very fast. Detailed information, including permits, can be obtained at the official BLM Paria Canyon site. Phone number for the Paria Canyon Permits Desk is (435) 688-3246. Other phone numbers: Main office, St. George, Utah (435-588-3200), Kanab, Utah, field office (435-644-4600). Paria Contact Station (closest to trailheads, where you should check in) is on US-89 about ten miles west of Big Water, Utah. It is open mid-March to mid-November. Alternate contact is Kanab, Utah BLM field office. Includes access info, trailheads, trail mileposts for Buckskin Gulch, Paria River to Lees Ferry. The Paria Canyon Wilderness Area offers spectacular canyon country scenery and an outstanding outdoor experience. The Buckskin Gulch (“The Dive of the Buckskin”) offers the mystery and astounding beauty of the slot canyon. Printable trail guide which includes the above online narrative, map, and guide. Conditions are constantly changing in Paria Canyon and Buckskin Gulch. You should not assume that this guide or any guide fully reflects current conditions. Always check in with the ranger at the BLM office in Kanab and determine current conditions before you start on your trip. Special Note: In 2010, a series of powerful flash floods caused changes in Buckskin Gulch and Paria Canyon. There may new obstructions which are not yet fully documented. Some campsites may have been washed away. The BLM recommends that you bring rope along for possibly bypassing obstructions. When you arrive locally, be sure to question a ranger closely on current conditions! What is the current Weather Forecast? Always get a weather forecast before going in the Buckskin Gulch or Paria Narrows! If you get caught in a flash flood there, it can potentially be fatal. Are flotation devices needed to negotiate any deep pools? Are ropes needed at any rock jams or other obstacles? Is drinking water available from the known springs? Which are reliable?